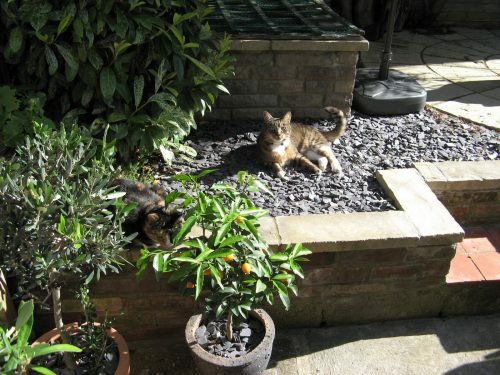 Cat friendly plants for your garden! Cat friendly plants for your garden! Cat friendly plants for your garden! Cats make great gardening companions. Not only do they love basking in a sunny spot on the patio, chasing butterflies and bees, they can also be partial to a nice bit of gnawing on their favourite plant. 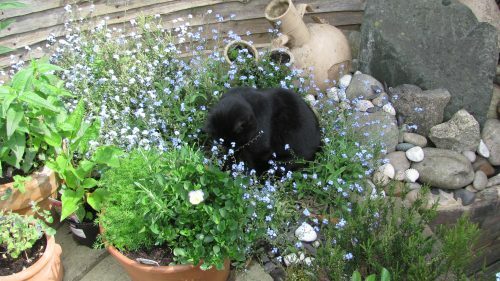 To celebrate National Gardening Week we compiled a list of the best cat friendly plants to grow for your cat’s purrsonal pleasure! Maisy, Simon’s real cat, loves mint! This is the plant most likely to be mangled by your pleasure-seeking puss as they love to roll around in it and sniff the scent of this tasty herb. To make sure some of your mint survives being trampled by your happy cat, grow some in pots, out of their reach! Probably the most well-know plant to give your cat a euphoric five minutes, catnip is easy to grow outside and you can also dry the leaves and stuff homemade cat toys if you’re the crafty type. You might not think it, but this fragrant herb really appeals to cats. They love to have a good sniff as they walk by, and have been known to have a nibble here and there. Jess exploring the new garden. If you’ve got an indoor kitty, then cat grass is a good alternative as it grows well in pots and is happy living inside. 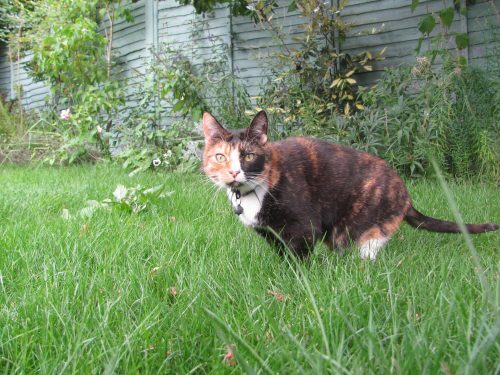 Cat grass is a doddle to grow from seed and easy to maintain for the less green-fingered amongst you. Your cat will love it too, as a regular chew on the leaves helps aid digestion. With similar effects on cats to catnip, Valerian root acts as a mild stimulant which cats react to with glee. Easy to grow (it reseeds itself every year if you don’t cut back the vanilla-fragranced flowers), just pull out the roots and hang them up to dry. 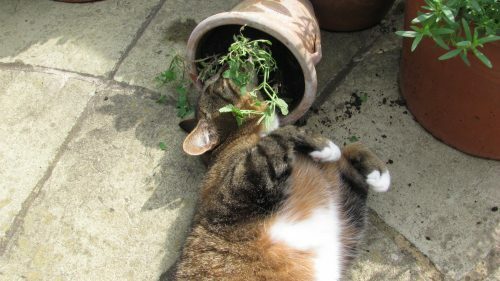 Another bushy plant that appeals to kitties, although they have to be careful as it can be toxic. So what’s so good about it? 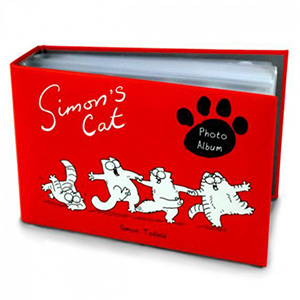 It acts as a natural flea repellant! 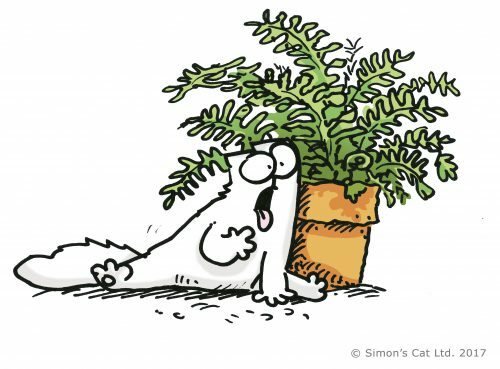 Just mind your cats don’t use your freshly dug holes for doing their business in like Simon’s Cat! Text written by Jen Smith.